EARRINGS - SARAH COVENTRY. "SATIN GLOW" FROM 1965. 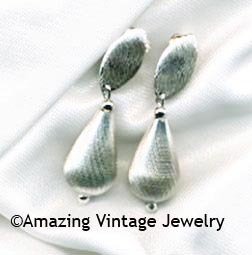 TEXTURED SILVERTONE TEARDROP, ELEGANT ENOUGH TO BE WORN WITH BLACK AT NIGHT, SIMPLE ENOUGH TO BE WORN WITH A CASUAL LOOK. CLIP. 1 13/16" LONG, 1/2" IN DIAMETER. VERY GOOD CONDITION.